Alex Gibney is a skilled filmmaker – I loved his documentary Going Clear: Scientology and the Prison of Belief (2015). His films are most compelling when he’s working a point-of-view; Sinatra: All or Nothing at All (also 2015) was a relative slog because Gibney didn’t have much of an axe to grind. Steve Jobs: The Man in the Machine has already upset some of the Apple faithful, but it’s mainly because Gibney was rude enough to collect and repeat many of the unflattering Steve Jobs anecdotes that have been circulating for years. Unfortunately, the film overreaches – Gibney posits that Steve Jobs was/is Apple, and by extension Apple customers are worshipping a false god. Gibney’s thesis is that Steve Jobs explicitly identified himself with Apple, and the company came to reflect his values (petulant self-interest above all else.) He wants people who use Apple products to question whether they might, in fact, be contributing to greater misery in the world. 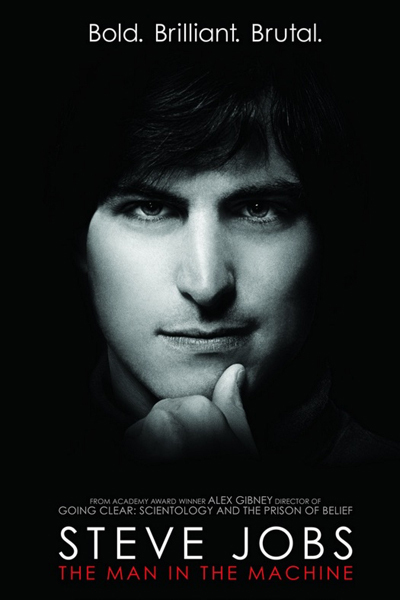 For that approach to work, Gibney’s film needs a much wider scope than just “Steve Jobs, The Man;” but when the focus broadens, the narrative urgency slackens and the movie resembles a second-rate Dateline exposé. Gibney’s repeated use of Jobs’ favorite songs (mostly Bob Dylan) seems to be intended ironically, as a means of highlighting the gulf between Jobs’ ideals and the reality of his villainy. Instead, the songs burnish the legend, framing Jobs as the icon he always wanted to be. Ultimately, Gibney’s notion about the shared moral responsibility of corporations and consumers is nowhere near as cinematic as the Steve Jobs story itself, which commands the spotlight and makes everything else in the film pale in comparison. The film is worth seeing, mainly as an album of Jobs talking, selling, and lying. There’s much to be disgusted by, also plenty to admire, in the Steve Jobs story – I wish Gibney had allowed his audience more leeway to explore and reflect on their own.